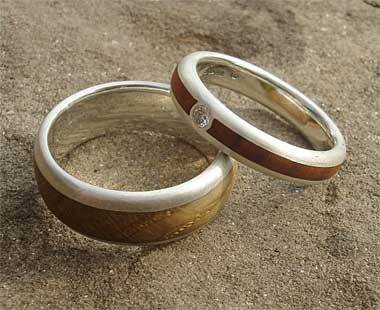 Inlaid Wooden Engagement Ring : LOVE2HAVE in the UK! 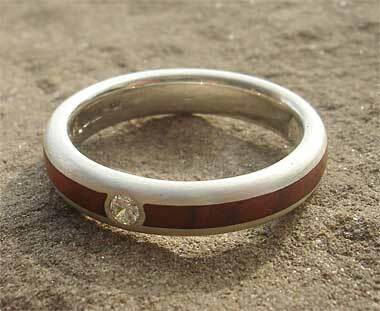 One of our beautiful inlaid wooden engagement rings made from sterling silver that comes in a rounded profile. All of these wooden engagement rings have a beautiful handcrafted quality to them making each one individual to the other. The inlays have a slight unevenness, and all the stones from this range come set into the actual metal. As the wood comes inlaid into metal, the metal protects the wood from wearing away, unlike an engagement ring made entirely from wood only. Natural wood is a unique material to use in a wooden engagement ring, and we think that a lady with an appreciation and love of nature would choose an engagement ring like this. The silver is a matte finish, and the inner is polished and therefore very comfortable. 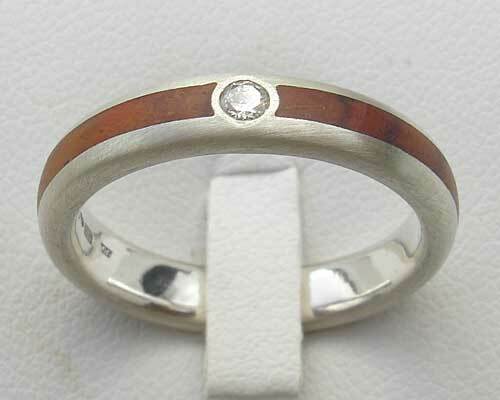 The wooden engagement ring featured on this page is the most affordable of our white diamond wooden engagement rings and measures 4mm in width and has a 1.8mm cocobolo wood inlay. The inlay comes beautifully cut in a circular style around a single 0.05 carat round white diamond. We think the colours on this engagement ring are outstanding with the reddish wood looking particularly striking and contrasting wonderfully against this colour of the diamond and the silver. The fitting of it is a comfort one, meaning it is slightly curved on the inside and glides nicely onto the finger. Precious stone(s) Available: 2.4mm / 0.05 ct round white diamond. Returns Policy: You may return this UK made wooden engagement ring if it is not to your satisfaction as long as it is not engraved. Please see our terms and conditions.